Looking at 2 Priuses, one 2008 with 420k miles, but a rebuilt engine was installed at 375k. And the other 2009 with 300k and no information available about the history as it is apparently a private resale dealer. This is for my nephew who is going to put about 10k on it per year to get him through college. He has no mechanical skills. Any opinions on this dilemma? 1) Did you replace the HV battery pack? Yes, it was replaced with a brand new pack at 255K. 2) Did you replace the hybrid transaxle fluid? Yes, every 100K. 3) Did you replace the brake pads? No, still looking good. 4) Your lifetime MPG (if available)? Estimated to be around 50 mpg. 5) How often do you change your oil? What brand / product did you use? Every 5K, usually Mobil One synthetic. 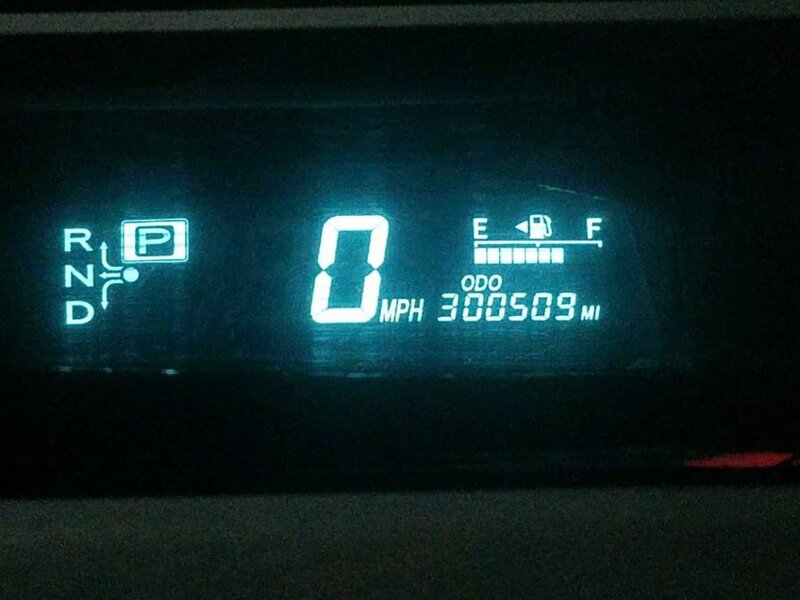 6) How about post a picture of 300,000 miles on ODO? See attached. Shane Burns and m.wynn like this. 9) Feel free to add anything else you wish to share. Engine was rebuilt around 180K due to oil burning. Very impressive! Thanks for sharing. I'm interested in the engine rebuild, like what the engine looked like torn down, piston rings shot? We don't hear of many rebuilds on the 2nd gen since they are so durable, BUT known for oil burning. When I had my 2005 it drove me crazy, ran great but burnt oil! Just joined this exclusive club. Disappointed that it is stuck at 299999 but keeping track using trip computer. Original battery pack. New ignition coils and spark plugs are the only thing done to power train. Hoping it will keep going. Aaron Vitolins, m.wynn and Raytheeagle like this. I just bought a gen 2 Prius advertised with 150,000 miles. 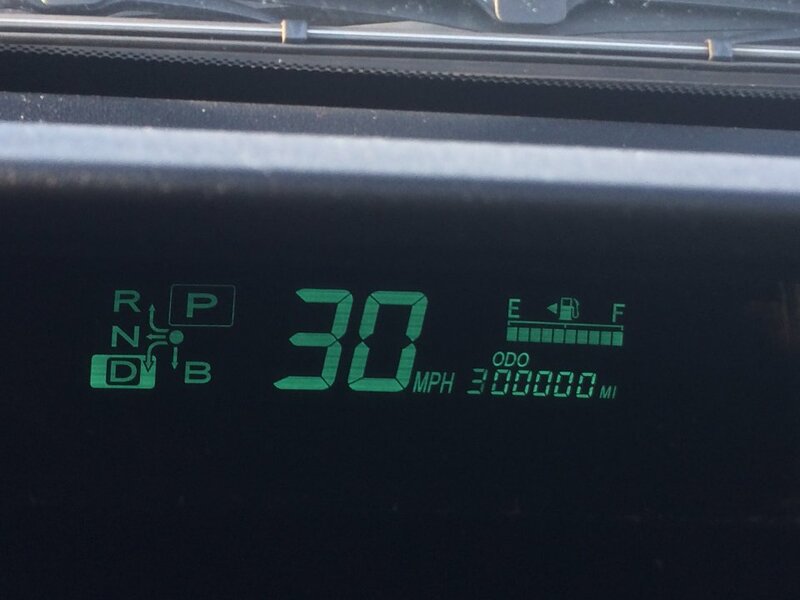 Found out an hour later at the dealership that it has 300,000 miles on it hahahahha! Turns out the gal that purchased it before me got the treatment!! She paid 5000 dollars for it and thought it had 115000 miles when really it had about 250,000. Service records show the hv battery was replaced at 180,000 in 2012. The guy that sold it to her more than likely changed out the dash to show less miles. What he didn’t count on was that a Supreme Court department of justices son would buy it after her HAHA! I’d be crapping my pants right about now if I was that individual... more to come. Has this ever happened to anyone here? I'm surprised it doesn't happen more often. It is easy to do if you know how. If you want to fix your ODO so it reads correct, we can tell you how to do that too. I was looking to buy a '08 Prius last year advertised at 163,000 km (101,280 miles) and when I did pre-purchase due diligence, I noticed the ODO climbed steadily every 6 months by mid 20,000's kms although the years (it was an ex taxi) until between May 16 and Oct 16 the ODO dropped from 453,890 km (282,034 mi) to 126,668 km (78,707 mi). So, in reality it had nearer 521,000 km (323,700 mi) on it. Just didn't like the way they were not up front about in the advertising. At least the price reflected the true miles and wasn't the bargain it first seemed. 2) Did you replace the hybrid transaxle fluid? Every 60K after I moved to Az. in 2007. Oil usage has been a head scratcher, reducing to 1500m/qt. after 150K, and rising back up to 4000m/qt after 300K. Entire drive train continues to be bullet proof, with clicking of valve lifters and low hissing noise when I go 40mph in stealth mode from the transmission, and more clicking when I do a slow sharp turn. Rough roads on my commute to work has caused the headlights to blink out requiring the lights to be turned off then back on. I have heard of other people that have the same problem and I am convinced that the problem is in the connectors because when I spray them with WD40 the problem goes away for awhile. Try that before you pay for an expensive Modual. Overall this car made for a great long distance commuter car. life time costs less than half of any other car selling when I purchased. The plug-in and full electrics have surpassed the Prius now, so I will not be buying another Prius, But this car will go down as the best car I've ever owned after 50 years of car ownership. Naurill, pashko90, m.wynn and 3 others like this. you bought a 10-year-old car with "150,000" miles. 150k or 300k, you didn't buy a classic Ferrari. Who cares? Aaron Vitolins and DMC-5180 like this. 1) Did you replace the HV battery pack? NO - still original. Unbelievably reliable and low cost/maintenance car all things considered. I fear I may lose it to cancer before any major/cost malfunctions. HV battery ventilation checked during rear strut replacement. Surprisingly clean. Will still run >100mph. Last run was 103 going up a slight incline w/ 3 adults in car. Ran out of road to safely continue. Aaron Vitolins, Raytheeagle, m.wynn and 1 other person like this. I have a 2008 with 293600 on it. I just got back for a 2,000 Mile road trip with no issues. It does burn a good bit of oil now though. My mechanic says he thinks it's just a leak in the seals but there is never any oil on the ground where I park so I'm not sure I believe that. I bought mine with 278000 miles on it about 6 months ago and so far I have had to get a new key, new tire, replace catalytic converters, new tire, breaks, starting battery, and replace a sensor in the hybrid coolant Reservoir. I can't complain though. I got it for $2500 and she was super clean and I have all the past survice records. Planning to keep here going as long as possible. Shane Burns and Aaron Vitolins like this. I hit 299,999 miles this week. 98,000 of those miles came within the last 24 months. I am impressed with Toyota to say the least. I bought this car at 201,000 miles and since have replaced the spark plugs, and 12v. battery... thats it. 1) Did you replace the HV battery pack? No, previous owner said no as well. 5) How often do you change your oil? What brand / product did you use? Whatever is on sale. 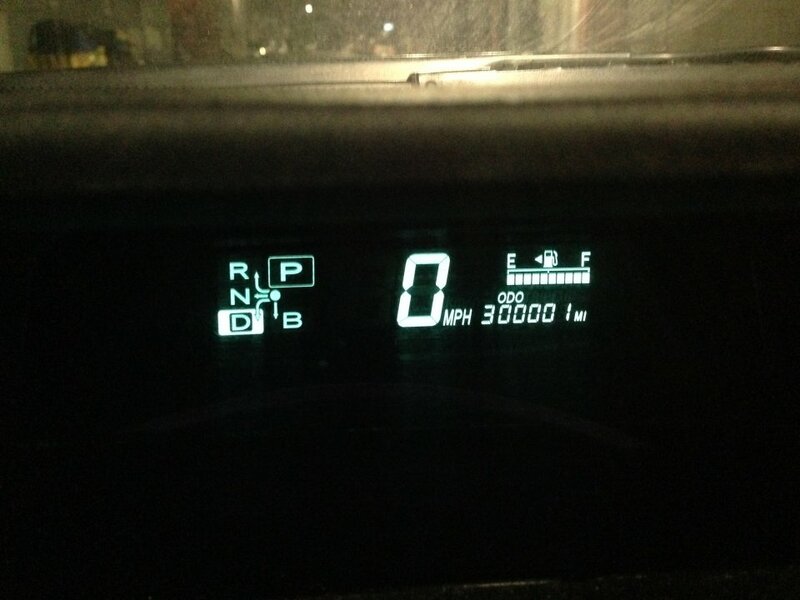 6) How about post a picture of 300,000 miles on ODO? I can add the picture later. 9) Feel free to add anything else you wish to share. I've been having little misfires here and there, but nothing big until this past weekend when the engine began sputtering quite a bit. I thought it had finally decided to die. Changed the spark plugs and COP boots, and now running better than before. Getting close - 288,401, but my combination meter board has gone bad. I just got the following helpful info from Matt at Texas Hybrid Batteries. All of the combo meters that came in the 04 and 05 model cars will stop at 299,999. We sell a conversion that replaces your meter with a newer version (06-09) that does not have the 300K limit. It will fix the failing display issue and the the odo limit which is great for you. The price is still the same as all of our rebuilt combo meters at $150. Orders placed on our website ship same day and take 2-3 business days to ship. Let me know if you have any other questions. I'm the third owner. First owner used it as a courier vehicle, second owner used it as just a daily driver. I believe both owners put the same amount of miles on the vehicle. I know fluids and inverter pump had been changed by the previous owner, but I did all of that, as soon as I bought the car.  Kaptainkid1, m.wynn, Shane Burns and 1 other person like this. The big 300,000 arrived to day! Tires get about 80,000 miles still drives straight. Arizona paint burn... LOl the heat is awesome!! One thing I have noticed is the battery is not draining as fast on hill climbs as fast with the replacement engine (about 130,000 miles on it) so it seems that the old motor was well down on power and leaning on the HV battery a little too much maybe.. Last trip back from LA we were able to zoom up the hills and still maintain healthy battery life. The trip before we were down to 60 MPH max with a drained battery. Work needed: Rear drums, 1 front wheel bearing, shocks and windscreen. Kaptainkid1, m.wynn, Aaron Vitolins and 2 others like this. audiodave and Aaron Vitolins like this. What kind of job has you driving 750 miles in a day? Do you transport railroad crews or something?